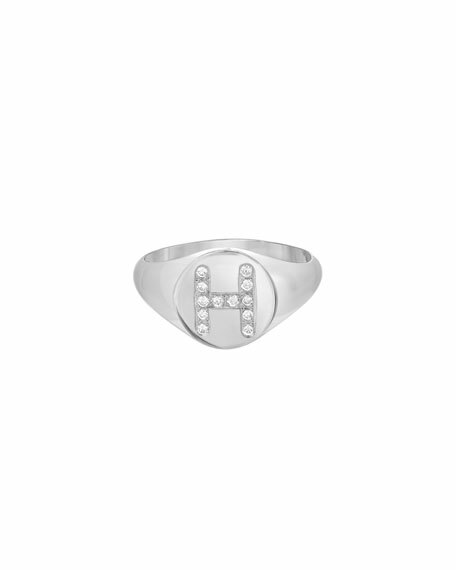 Diamond initial small signet ring by Zoe Lev Jewelry. Solid 14-karat white gold with white diamond initial. White VS diamond pavé initial at center. Choose single block letter initial. Armenta ring from the New World Collection. Oxidized sterling silver. Pavé black sapphires trim scroll design. Bezel-set champagne diamonds. 0.02 total diamond carat weight. Made in the USA. Armenta stackable band ring from the Old World Collection. Midnight oxidized sterling silver. Pave champagne diamonds, 0.69 total carat weight. Armenta stackable band ring from the Old World Collection. Midnight oxidized sterling silver. Pave champagne diamonds, 0.69 total carat weight. Approx. 4mm wide.